I got inspired last winter to carve some spoons for gifts for the holiday season. 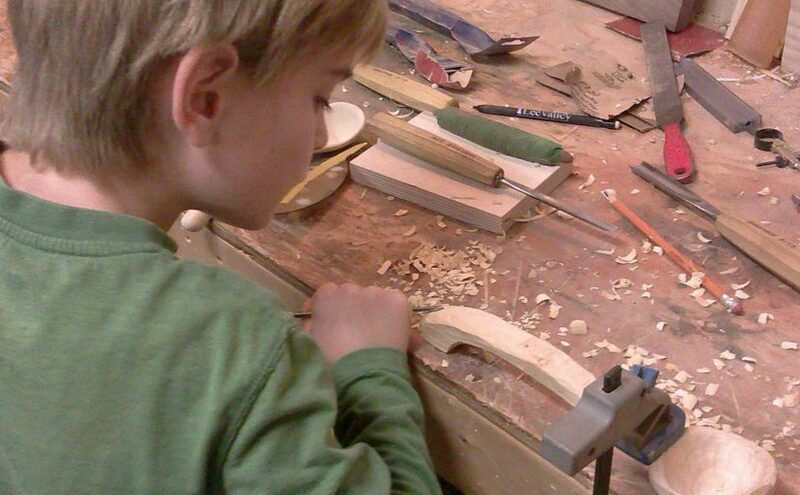 My kids loved hanging out in the wood shop with me, and they decided that they wanted to help carve a wooden soup spoon for their mom. Not only did they both participate in using the chisels to shape and texture the spoon, they also came up with the idea to carve a heart into the end of the handle. I was very proud of my son and daughter for listening to my safety expectations so that they could carefully use the sharp chisels. I love teaching them how to use hand tools to create their own wood projects, because we get to spend that special time together and they feel so good about what they have made with their hands. We finished the spoon with food-grade oil & beeswax finish, then wrapped it up to give to mom! Watch for the next blog to see a photo of it finished.